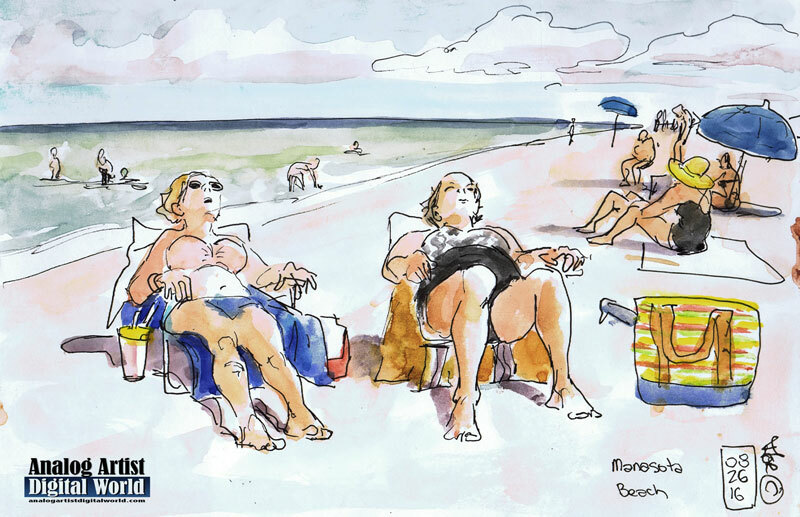 Analog Artist Digital World: A day at Manasota Beach. I visited my older sister Pat Boehme, in Port Charlotte Florida for a weekend to getaway from the stress of my pending divorce. Pat has a home on a traffic circle and that circle was enlarged over the past year. She lost some of her property to the expansion project and had to live with her front yard being a construction zone. Now my life is a construction zone. We decided to get away to Manesota Beach which is north of Port Charlotte. The beach is accessed by a small coastal road that has water visible on both sides One side had mansions on the inter-coastal waterway, and the other side had mansions on the ocean. We joked about which mansion would suit our lifestyles the best. Pat had a cooler, beach umbrella and beach chairs, so we were set for the afternoon. Getting all that from the parking lot to the beach was it's own adventure. The cooler had wheels, but that doesn't help much in tall grass or sand. I ended up hugging it to my chest to get it to our beach oasis. The water was warm and comfortable. We swam and floated for hours. The water must have been super saline, because I was able to float on my back for the first time ever. Usually my 12 inch big feet sink like lead weights. The two women next to us were debating about exercise and diet. The woman in the pink bikini top outlined her extensive daily exercise routine, while the other woman felt it was more important to simply watch her calorie intake. Foreigners waded face down with snorkel masks just off shore looking for sharks teeth. Apparently fossilized sharks teeth are a common find at Manasota Beach. One Australian was face down in the water the entire time that Pat and I were there. When he final sloshed out of the water, we could see that his back was a bright fire engine red. He was going to be hurting that night. A little boy lost hold of his inflatable mini canoe. The wind caught it, sending it out into the ocean. He chased it until the water got too deep, and then watched it until it became a speck on the horizon.